It's that time of the year again. We prepare to take our little out trick-or-treating awaiting the sugar-induced craziness that follows. Try and avoid super dark costumes. If your child is wearing all black, put some reflective tape on the front and back so drivers can see them. Dress your children (and yourself) for the weather/conditions. It's going to be a chilly one here so we made sure to get a costume to accommodate some warm cozies underneath. Makeup is better than masks. Masks can obstruct vision. Ensure costumes fit well to avoid tripping etc. Check your child's candy. 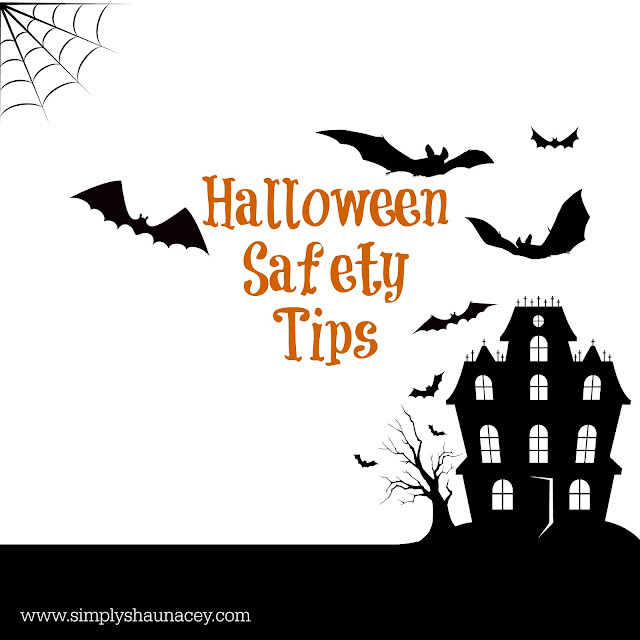 Get rid of any homemade treats or any candy that's wrappers are partially opened or appear tampered with. Make sure you pull a few of your favs aside while you're doing said check. If you have young children be wary of small candies and gum that might present as a choking hazard. Consider children with food allergies and have a separate bowl with some allergy-friendly treats (some of the most common allergies are dairy, peanuts and wheat). You could even have stickers, playdoh or small toys to give to these children. Confirm they're going with friends and who they're going with. Make sure their name and contact info is on their person. Tell them not to go inside anyone's home (that they don't know). Tell them not to eat anything until they get home (good luck with that). Send them with a flashlight or give them some glowsticks. Ensure they or one of their friends has a phone and has your number. Get the 'good candy' or you run the risk of your house being egged. The upside to this is that you get to eat the leftovers. On that note: buy lots. If you run out, you also run the risk of getting your house egged. If your kids are really young, don't let them have too much candy before you expect them to go to sleep. It won't be good. Ration the candy. Pick a number you're comfortable with and that's how many treats they get a day. Or leave it open: candy serves as a great reward for good behavior. Make sure you tell your child ahead of time about the 'parent candy tax'. If they're bringing candy in the house, you get a cut. Thems the breaks kids. Hot chocolate and baileys would not be noticeable in a travel mug. Just sayin'. Be safe, have fun and HAPPY HALLOWEEN! !